That the WWI was a largely static war it is a commonplace definition, which may not be so stimulating to approach new insights in its history but is in many regards correct, at least if we keep the common anthropocentric point of view. Nevertheless, animals counterbalanced someway the motionless of the human beings: While soldiers were lying in the trenches, pets were often employed to move constantly between the front line and the HQ. Dogs for example. A conservative estimate places the number of dogs employed at nearly 50.000, most of them enrolled in the German and French Army (Americans troops borrowed dogs from their allies, since they had no organized dog units). A variety of breeds (above all German Sherperd and Labrador Retriever) were used during the Great War for different purposes. As pigeons, dogs were employed to deliver messages, but – different from the birds – they were also able to transport others materials, carrying food and ammunition for troops. They were also used for sentry and scout, even to haul machine guns on wheeled carts. We’ll try to consider each of these dogs units in the future posts, we'd like to focus for the moment on a special one used during the WWI, i.e. 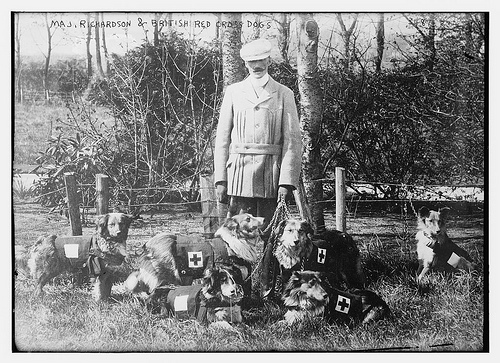 the Red Cross dogs, also called "mercy dogs". 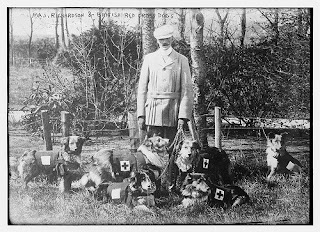 These animals were trained to provide wounded men with two essential service. Firstly, they carried medical supplies and small canteens of water or spirit, so that wounded soldiers, if conscious, could avail themselves of these supplies. Secondly, the mission of Red Cross dogs was mainly to search and rescue soldiers, who were not able to move. If the wounded man was behind his own battle line, the mercy dog had simply to call for his handler. If they had to work in no man's land, the dogs were trained, once a wounded man was located, to return to their handler carrying the helmet or a piece of his uniform in order to inform the medical unit this way, someone who needed urgent help had to be rescued. To accomplish their mission mercy dogs had to deal with deadly gases, slit trenches and artillery. Sometimes dogs were able to drag men into protective places and trenches before alerting their master.